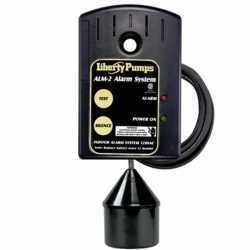 The ALM-2-1 from Liberty Pumps is a Indoor High Liquid Level Alarm, 86 decibel horn, 10' cord. It's a 115V, indoor alarm with a 10' float cord for Sump, Sewage and Effluent Pumps. This Liberty Pumps part is Nema 1 Indoor rated, has a 9V back-up battery, and is equipped with an 86 decibel horn. Easy and fast to install. Very helpful.